"Taklamakan" redirects here. For the novelette by Bruce Sterling, see Taklamakan (short story). 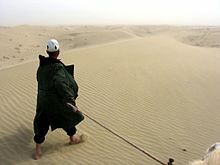 The Taklamakan Desert /ˌtæk.lə.məˈkæn/ (Chinese: 塔克拉玛干沙漠; pinyin: Tǎkèlāmǎgān Shāmò, Xiao'erjing: تَاكْلامَاقًا شَاموْ‎; Uyghur: تەكلىماكان قۇملۇقى‎; Dungan: Такәламаган Шамә), also spelled "Taklimakan" and "Teklimakan", is a desert in southwest Xinjiang in Northwest China. It is bounded by the Kunlun Mountains to the south, the Pamir Mountains and Tian Shan (ancient Mount Imeon) to the west and north, and the Gobi Desert to the east. The Taklamakan Desert has an area of 337,000 km2 (130,000 sq mi), making it slightly smaller than Germany, and includes the Tarim Basin, which is 1,000 kilometres (620 mi) long and 400 kilometres (250 mi) wide. It is crossed at its northern and at its southern edge by two branches of the Silk Road as travellers sought to avoid the arid wasteland. It is the world's second largest shifting sand desert with about 85% made up of shifting sand dunes ranking 16th in size in a ranking of the world's largest deserts. Some geographers and ecologists prefer to regard the Taklamakan Desert as separate and independent from the Gobi Desert region to its east. The People's Republic of China has constructed two cross-desert highways. The Tarim Desert Highway links the cities of Hotan (on the southern edge) and Luntai (on the northern edge), and the Bayingol to Ruoqiang road crosses the desert to the east. In recent years, the desert has expanded in some areas, its sands enveloping farms and villages as a result of desertification. The Golmud-Korla Railway (presently, under construction; expected completion time, 2019) will cross the Taklamakan as well. Because it lies in the rain shadow of the Himalayas, Taklamakan is a paradigmatic cold desert climate. Given its relative proximity with the cold to frigid air masses in Siberia, extreme temperatures are recorded in wintertime, sometimes well below −20 °C (−4 °F), while in summer they can rise up to 40 °C (104 °F). During the 2008 Chinese winter storms episode, the Taklamakan was reported to be covered, for the first time in its history, entirely with a thin layer of snow reaching 4 centimetres (1.6 in), with a temperature of −26.1 °C (−15 °F) in some observatories. Its extreme inland position, virtually in the very heartland of Asia and thousands of kilometres from any open body of water, accounts for the somewhat wide diurnal temperature variation. The Taklamakan Desert has very little water, therefore it is hazardous to cross. Merchant caravans on the Silk Road would stop for relief at the thriving oasis towns. It was in close proximity to many of the ancient civilizations — to the Northwest is the Amu Darya basin, to the southwest the Afghanistan mountain passes lead to Iran and India, to the east is China, and even to the north ancient towns such as Almaty can be found. The key oasis towns, watered by rainfall from the mountains, were Kashgar, Marin, Niya, Yarkand, and Khotan (Hetian) to the south, Kuqa and Turpan in the north, and Loulan and Dunhuang in the east. Now, many, such as Miran and Gaochang, are ruined cities in sparsely inhabited areas in the Xinjiang Autonomous Region of the People's Republic of China. The archaeological treasures found in its sand-buried ruins point to Tocharian, early Hellenistic, Indian, and Buddhist influences. Its treasures and dangers have been vividly described by Aurel Stein, Sven Hedin, Albert von Le Coq, and Paul Pelliot.Mummies, some 4000 years old, have been found in the region. Later, the Taklamakan was inhabited by Turkic peoples. Starting with the Han Dynasty, the Chinese sporadically extended their control to the oasis cities of the Taklamakan Desert in order to control the important silk route trade across Central Asia. Periods of Chinese rule were interspersed with rule by Turkic, Mongol and Tibetan peoples. The present population consists largely of Turkic Uyghur people and ethnic Han people. This desert was explored by several scientists such as Xuanzang, a monk in the 7th century and by the archaeologist Aurel Stein in the 20th century. Atmospheric studies have shown that dust originating from the Taklamakan is blown over the Pacific, where it contributes to cloud formation over the Western United States. Studies have shown that a specific class of mineral found in the dust, known as K-feldspar, triggers ice formation particularly well. K-feldspar is particularly susceptible to corrosion by acidic atmospheric pollution such as nitrates and phosphates. Exposure to these constituents reduces the ability of the dust to trigger water droplet formation. Further, the traveling dust redistributes minerals from the Taklamakan to the western U.S.A. via rainfall. The issue #39 'Soft Places' of Neil Gaiman's The Sandman takes place in the desert, when Marco Polo gets lost in the desert. A portion of the Korean quasi-historical TV drama series Queen Seondeok takes place in the Taklamakan Desert. Sohwa escapes from Silla with baby Deokman and raises her in the desert. As a teenager, Deokman returns to Silla and uses the knowledge and experience gained from life among international traders in the Taklamakan trading centers to gain the throne of Silla. ^ Pospelov, E. M. (1998). Geograficheskiye nazvaniya mira. Moscow. p. 408. ^ Jarring, Gunnar (1997). "The Toponym Takla-makan". Turkic Languages. 1: 227–40. ^ Hobbs, Joseph J. (14 December 2007). World Regional Geography (6th ed.). Wadsworth Publishing Co Inc. p. 368. ISBN 978-0495389507. ^ Baumer, Christoph (2008-06-30). Traces in the Desert: Journeys of Discovery Across Central Asia. B. Tauris & Company. p. 141. ISBN 9780857718327. ^ Hopkirk, Peter (1 November 2001). Foreign Devils on the Silk Road: The Search for the Lost Treasures of Central Asia. Oxford University Press. p. 12. ISBN 978-0192802118. ^ Sun, Jimin; Lou, Tungsten (2006). "The Age of the Taklimakan Desert". Science. 312 (5780): 1621. doi:10.1126/science.1124616. PMID 16778048. ^ a b Ban, Paul G. (2000). The Atlas of World Archeology. New York: Check mark Books. pp. 134&n dash, 135. ISBN 978-0-8160-4051-3. ^ "Taklamakan Desert". Encyclopædia Britannica. Retrieved 2007-08-11. ^ "The World's Largest Desert". geology.com. Retrieved 2007-08-22. ^ "China's biggest desert Taklamakan experiences record snow". Xinhuanet.com. February 1, 2008. ^ Hopkirk, Peter (2001). Spies Along the Silk Road. ISBN 9780192802323. Retrieved 2007-08-07. ^ Whitfield, Susan; Library, British (2004). The Silk Road: Trade, Travel, War and Faith. ISBN 9781932476132. Retrieved 2007-08-25. ^ "The Silk Road". Archived from the original on 2016-03-15. Retrieved 2007-08-07. ^ Wade, Nicholas (2010-03-15). "A Host of Mummies, a Forest of Secrets". The New York Times. Retrieved 2014-12-28. ^ Xinjiang territory profile, BBC News. May 7, 2011. ^ Fox, Douglas (2014-12-22). "The Dust Detectives". High Country News. Vol. 46 no. 22. Retrieved 2017-09-02. Jarring, Gunnar (1997). "The toponym Takla-makan", Turkic Languages, Vol. 1, pp. 227–240. Tamm, Eric Enno (2010). The Horse That Leaps Through Clouds. Vancouver/Toronto/Berkeley: Douglas & McIntyre. ISBN 9781553652694 (cloth); ISBN 978-1-55365-638-8 (ebook). Warner, Thomas T. (2004). Desert Meteorology. Cambridge University Press, 612 pages. ISBN 0-521-81798-6. Wikimedia Commons has media related to Taklamakan.